End of October, start of November. Perhaps not the obvious time of year for a wedding but now that we no longer have to carve pumpkins or buy sparklers Simon and I have leapt at the chance to celebrate it. And so was born the WAWA (Wedding Anniversary Weekend Away) to prevent us from going gaga (I know...but I couldn’t help myself). When even the trick or treaters give you a wide berth – despite the fact that you have a bucket full of lollipops and sickly sweets and you’re sat wearing the witch’s hat, nose and wig that you’ve fished out from the bottom of the dressing-up box waiting to answer the door – you know it’s time to move on. At least for a few years. The Wedding Anniversary, something of an afterthought when buried under the chaos of bonfires, monster costumes and eyeballs-in-jelly, has come into its own. A reason to celebrate, to get away. No more trick-or-treat rejection. Take one car in working order, the Eurotunnel and toll roads and voilà! 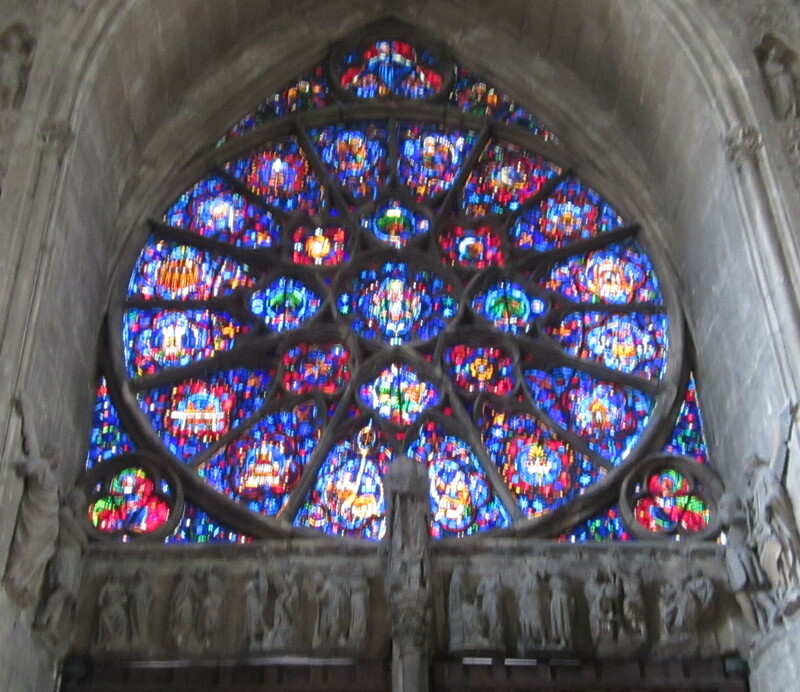 In Reims. Just 2 and half hours from Calais. After having booked I was told that it wasn’t one of France’s most beautiful cities not least because of the damage it had suffered during both World Wars but as we were only staying 2 nights that didn’t bother us. Honestly? Sleepy and jaded. That’s not to say that we didn’t like it. We did. A lot. 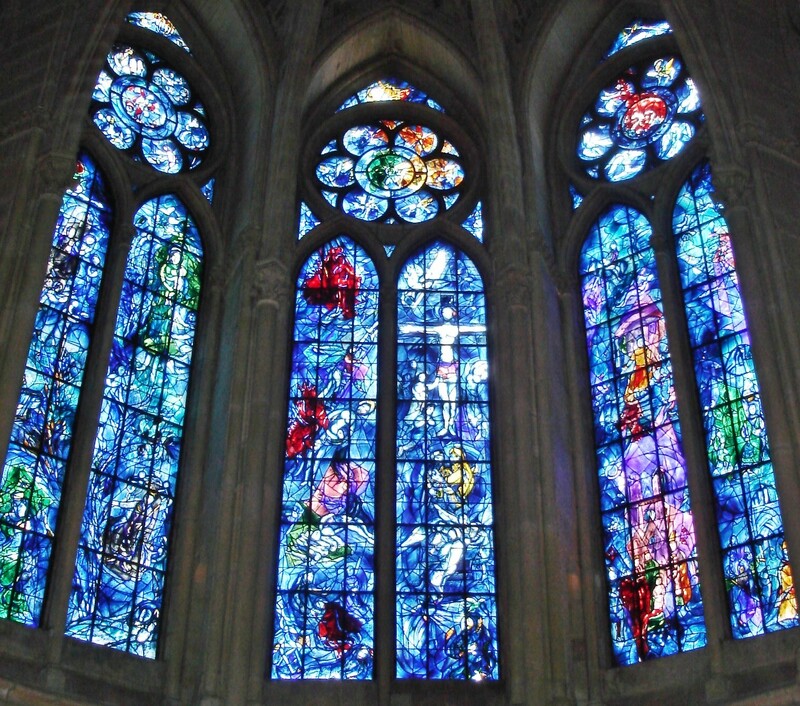 A ‘Sagrada Familia‘ in reverse – less a work in progress and more one in a chronic state of disrepair – Reims cathedral still managed to take my breath away with the beautiful blue of its medieval stained glass windows. 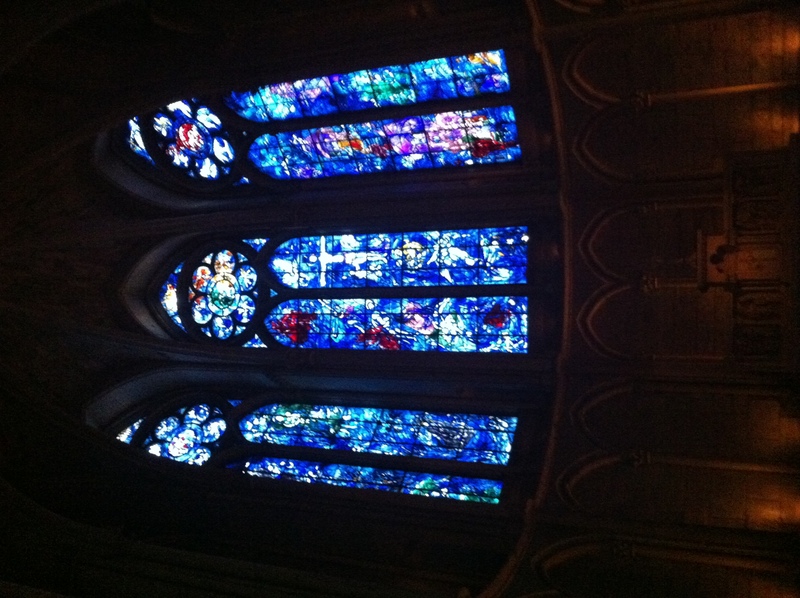 Those created by Chagall for the apse in 1974 were also a treat. 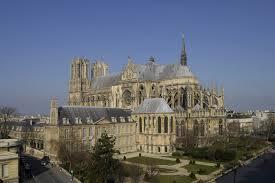 The kings of France were crowned here and the coronation story was everywhere. 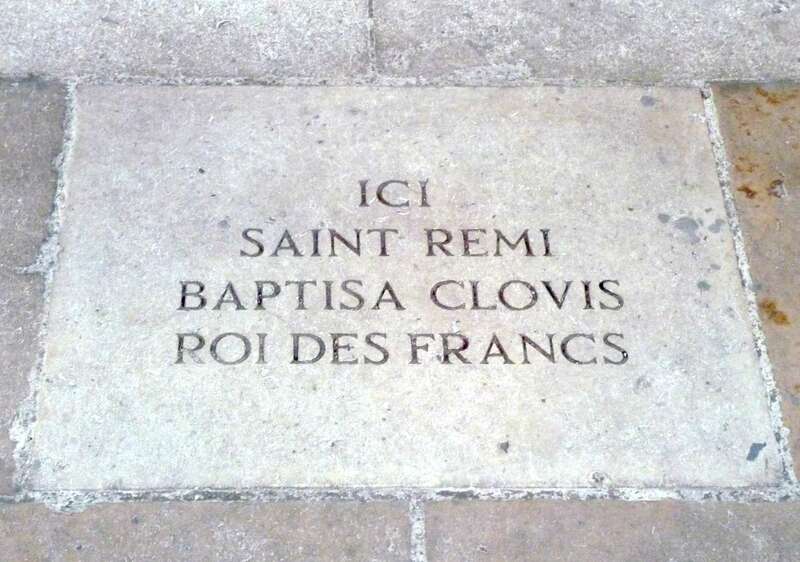 Clovis was baptised here by Saint Rémi. And Charles VII was crowned here after his liberation by Joan of Arc. 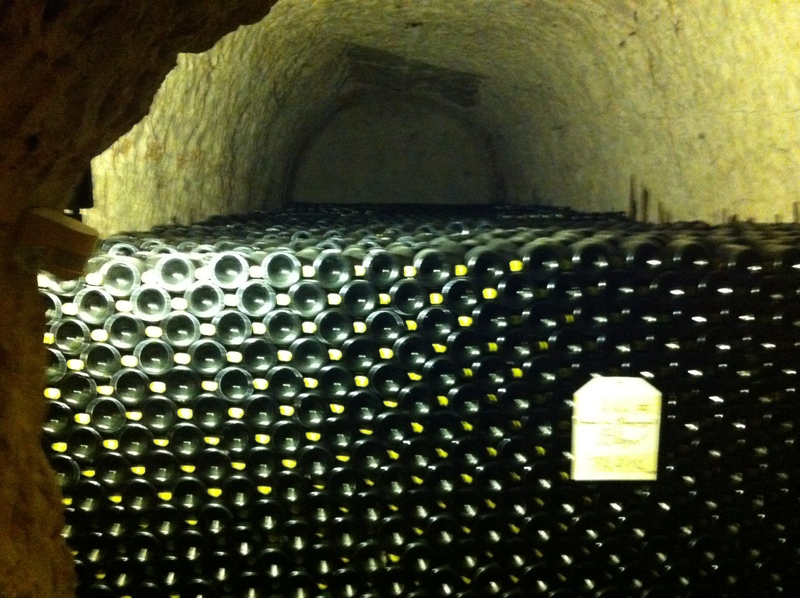 The next day we went on a tour of the cellars of a well-known Champagne house. Many of the tours available sounded a real treat with lunch and champagne tasting however they also came at a price. A price that we couldn’t afford. And so we quickly ruled these out, convincing ourselves that we would have hated them. Hence the one hour tour of the Taittinger cellars which for the modest sum of 12 euros per person we got a little introductory film, a guided tour of the cellars and crayères (chalkpits) given by an enthusiastic and well-informed tour guide, followed by a glass of Taittinger champagne. That afternoon we drove along the champagne route to Epernay and the village of Hautvillers where Pierre Pérignon (Dom to his fizz-drinking chums), a Benedictine monk, came upon the méthode champenoise in 1670. We stopped off at a shop recommended to us called ‘no.36’ which sells champagne at producers’ prices. Simon was tempted to buy a case but I still couldn’t do it. I’d forced Simon to buy a bottle of crémant from Carrefour the night before (I know. Not quite the spirit when in Champagne country) although I did agree that he should buy 1 bottle of champagne so that we could conduct our very own ‘ taste the difference’ test later. . . The results? Let’s just say that I have Plebian tastes. Perhaps so… but bubbles are bubbles. We ate out at a restaurant five minutes away from our apartment called ‘La Table Amoureuse d’Anna S‘ as recommended by the owner of our apartment. This proved to be a good recommendation as this turned out to be a lovely evening – service was extremely good, friendly and helpful with the waiter wanting to practise his English on us. I’ve not been to France for a while and so this was a first for me – the new, friendly French waiter. The food was a treat – herb-crusted mussels in garlic butter, and an exclusively French- cheese cheese board. The next evening we opted for a restaurant that was even nearer called ‘Le Chapeau Melon’ (the bowler hat). This was not such a fine eating experience and the waitress was miffed that we spoke French but the quality of the food was good and on a cold November evening we did not fancy traipsing round Reims looking for a place to eat. We have discovered the joy ( there is no other word for it) of staying in apartments when on city breaks. You can wake up when you please, eat what you like, rest when you’re tired, sit on a sofa in your own small but perfectly formed front room and not have to interact with other human beings (other than those with whom you’re sharing the apartment) until you need to. However, sometimes the reality of where you stay can occasionally exceed even the most attractive of images. As in this case. old shutters – who would have thought! This has to be one of the most beautiful places we have ever stayed in. We could not have been more delighted with the owner’s genuine helpfulness – he recommended a good and affordable champagne, took time to show us how to use all appliances, suggested restaurants and as for the accommodation, it was sheer luxury from the fluffiness of the towels to the crispness of the bed linen. 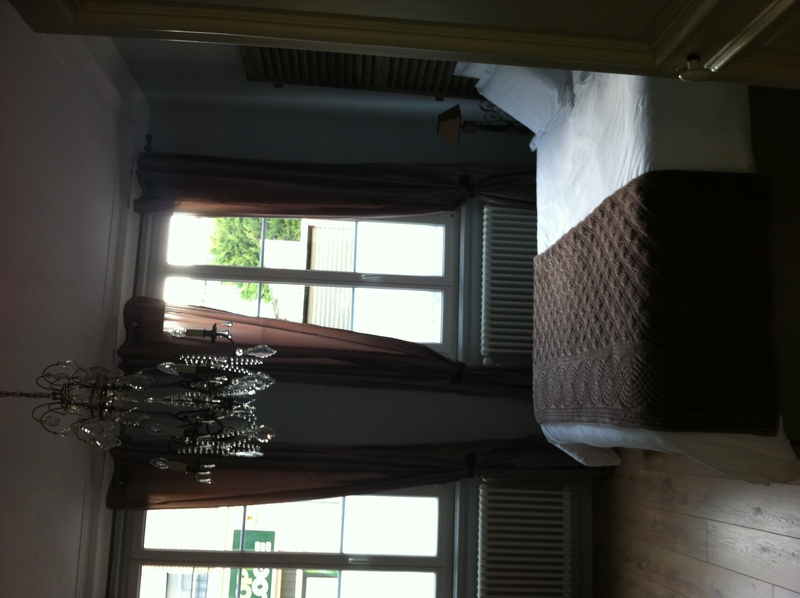 Immaculate, tasteful, warm, opulent, stylish with beautiful chandeliers, luxurious curtains and high ceilings. Even the coffee machine was a thing of beauty ( and great coffee). The private parking was also good and there were bikes in the utility room which we could have used (and would have done if we had stayed longer). So beautiful it could grace the pages of a magazine. If you’re looking for a treat then this is the place to stay. Sad to leave! 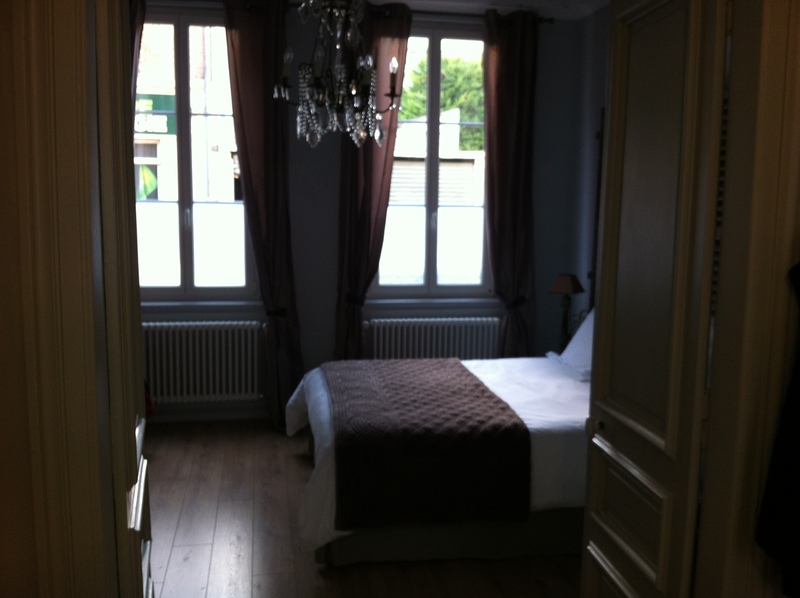 It is worth going to Reims just to be able to stay in this apartment. We set off for Lille excited because Bruno and Patricia, the owners of the Reims apartment, told us that Lille was ‘branché’ and like a little Paris. Reims had been quiet it’s true and so we were ready for something more bustling. It was a very rainy grey day and Lille turned out to be a big grey northern city. We came in via the south west and we parked on this side of the city as our aparthotel (Adagio Access) was located in this area. I’d wanted the French experience, all cafes, brasseries and bistros. Instead I saw extreme poverty, young teenage men on drugs and closed up shops and I didn’t like it. We headed for the centre and decided to pop into a brasserie called…but no. That’s not fair. I’ve already named and shamed the ‘aparthotel’. (The shaming comes later.) Let’s face it, if I’d done my homework we wouldn’t have stepped over the threshold. But I didn’t and we did. The rough and ready waiters with the ever expanding waistbands added a certain gallic northern charm to the place and we threw ourselves into the experience. Simon ordered the ‘Welsh’ –like welsh rarebit apparently and a local speciality. I chose ‘hachis parmentier‘ – it was a cold day and so some hearty stodge wouldn’t go amiss. Simon’s Welsh turned out to be a bowl of melted cheese, soggy toast, topped with a fried egg floating on a puddle of oil which glistened on top of the cheese. I ‘d so very nearly gone for that. Lucky escape. Then my dish turned up – piped smash with a brown stain on the lefthand underside. Still, internally I gave a sigh of relief when I looked over to Simon’s plate and considered what could have been. Thankfully the Christmas beer – papa noël – was fine. Uninspiring but comforting in both name and taste I had another. Which brings me unpleasantly to the door marked ‘toilettes’. I opened it – 4 urinals to the left and 2 cubicles beyond. Hard to express the panic your average British woman experiences when faced with a dilemma such as this. My heart pounded. My eyes surveyed the area looking out for men loitering with the sole purpose of ravishing me. Unsurprisingly there weren’t any and so I seized my chance. A dash to the cubicle. But then I had to get out. At moments like this it is said that adrenalin kicks in and I can confidently say that it did as I swung open the door hellbent on knocking out any would be furtive fumblers on the other side. I won’t be returning to the brasserie in a hurry. 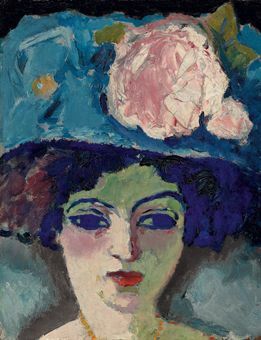 We escaped the brasserie and went in search of culture and found it – the ‘musée des beaux arts’. This was so good that I nearly found myself having a good time. But 2 hours with an audio-guide and paintings by the likes of Breughel, el Greco and Picasso couldn’t detract from the fact that we were suffering from a bad case of museum legs. Time to go to the ‘aparthotel’.. The receptionist was lovely – but even the memory of her smiley helpfulness could not stem the onset of dread as we wandered round the labyrinthine paths and corridors en route to our block. Yes. Block. As we stepped into the lift the light flickered off and on only to go off completely as the door opened up and we walked out of the darkness and into the most foul smelling light. A condemned woman, I walked to the end of the corridor wrinkling my nose frantically. I felt pathetic as I put my arm across my nose and inhaled the washing powder smell still on my jumper. When I looked around the room looked clean – white sheets, a pristine kitchen area, surprisingly stain free white towels. I pulled myself together. It was only for a night. But the smell. The smell. It was so bad. I looked up where we were staying on trip advisor and there it was. The review that I should have read before we booked, the one where the reviewer wrote that the place was ok , you got what you paid for, but ‘I don’t think I’d take the wife’. As’ the wife’ myself I think that’s a good advice . It was cheap but as I woke up throughout the night waiting for the morning I felt polluted by the stench. Next morning , we got up and out and headed for Vieux Lille. We parked with no problem in the underground carpark in the centre and headed to Meert, an old world salon de thé, for breakfast. 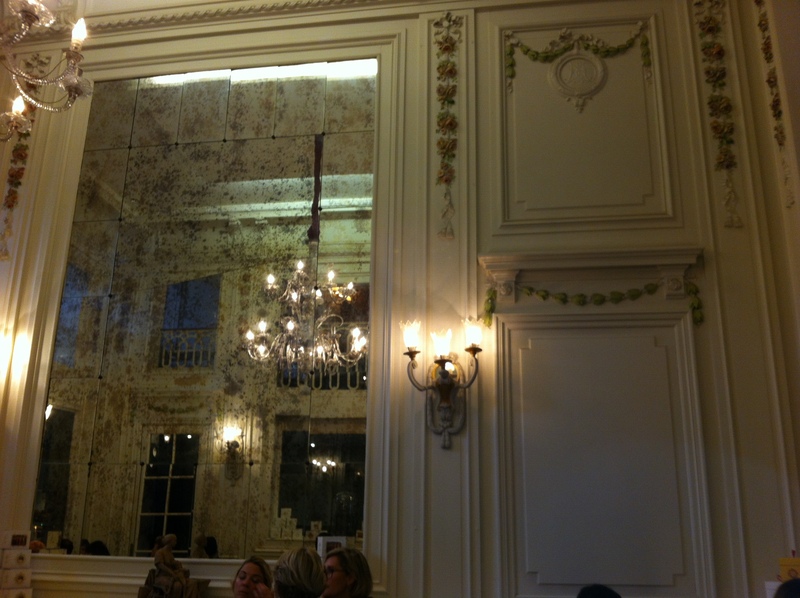 It was delightful – light, elegant and the only smell was of the coffee. A shop which sold meringue cakes, confections of meringue covered with whipped cream and chocolate. 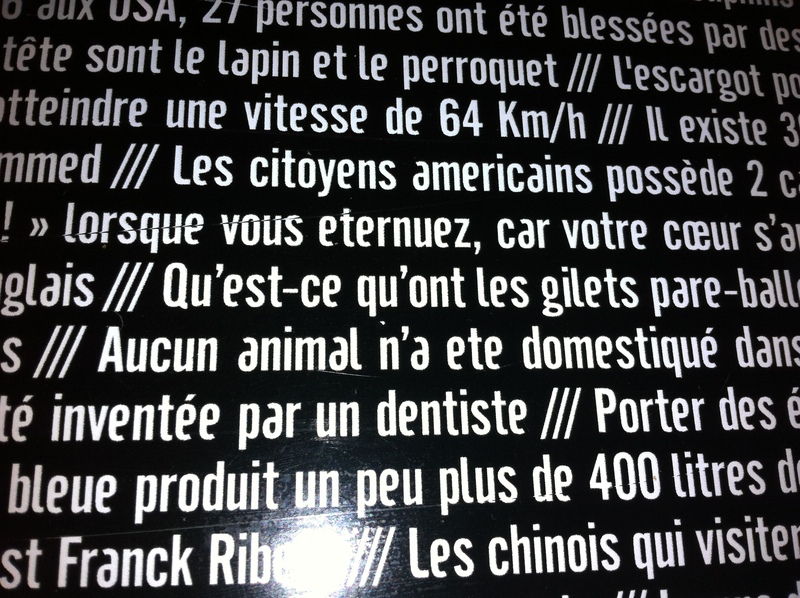 Then we came across a fish restaurant , l’Huitière, where we would have eaten if we’d only seen it sooner. If only we’d found this area yesterday. In fact, if only we’d stayed in an apartment in this area our impressions of Lille would have been so very different. Perhaps we’ll come back again next year. We drove back to the tunnel via a little town called Bergues where we stopped for a speedy lunch before dashing off in search of a supermarket to stock up on wine and cheese only to learn that supermarkets don’t always open on a Sunday in France. It pays to do your homework…and next time we will. what to drink – champagne . Of course.